item 1 >>> Now Playing… You Can’t Do That Recorded and released by Harry Nilsson in 1967, the original Beatles mash-up. They heard it and liked it, and it was the start of a lifelong friendship between him and the Fab 4, especially John. item 3 >>> Say “Cheese…and Steak!”…On March 25, 1966, the Fab 4 assembled at the studio of photographer Robert Whitaker. He was Australian they met during their 1964 tour. They liked his work, so he moved to England with Brian Epstein’s encouragement. 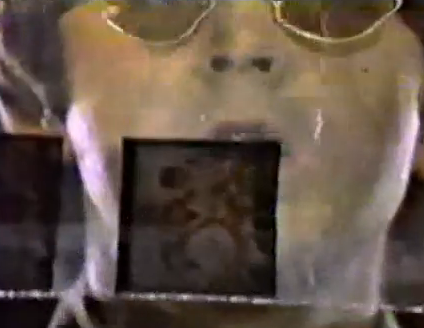 John Lennon described him as a “Salvador Dali” type. At this point, photo shoots were a crashing bore for the boys, but Whitaker had an offbeat idea that intrigued them. It was to be 3 photos…a triptych. On the left would be a picture of the Beatles being “born” from a single woman…with sausages representing the umbilical cord. 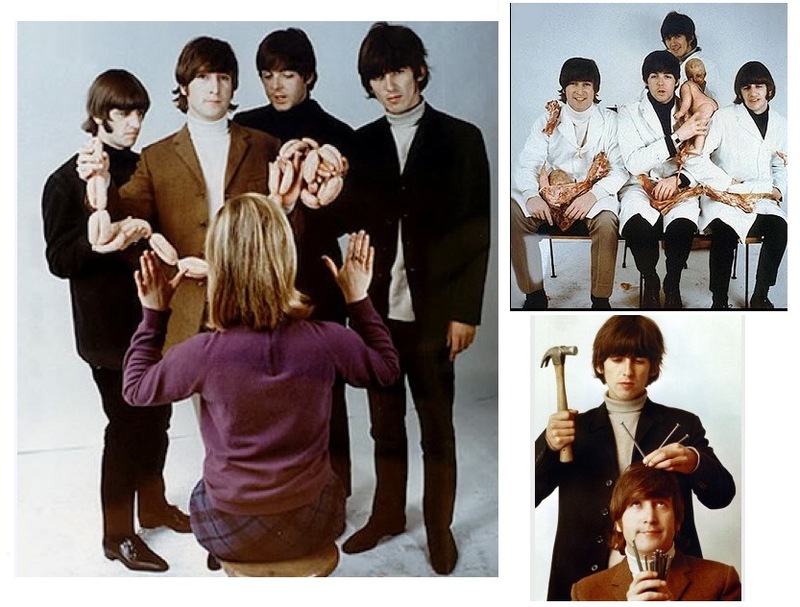 On the right, George pretending to bang nails into John’s head, meaning the Beatles were just normal people, “like wood.” In the center photo they would be dressed in butcher’s smocks, draped with hunks of raw meat and dissembled naked baby dolls. This was intended simply as an outrageous and incongruous image of the “squeaky clean” Moptops. item 4 >>> Fun While It Lasted…The project was eventually abandoned and the triptych never completed. 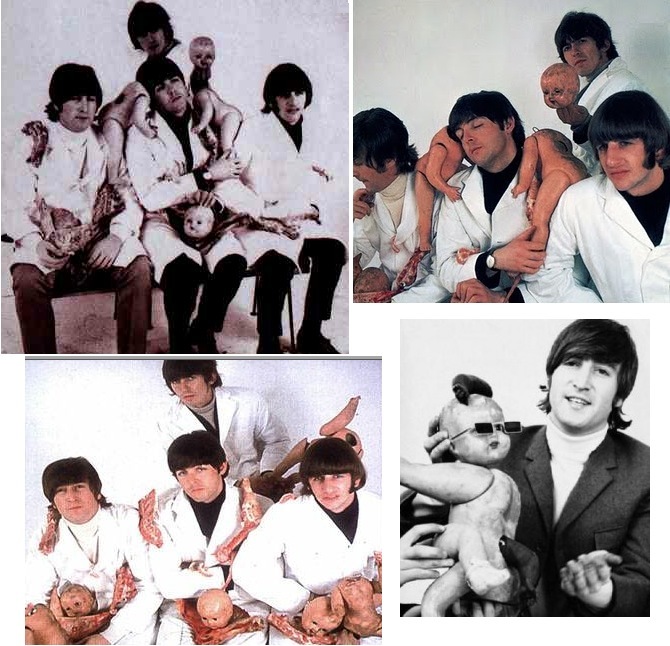 According to Whitaker, the butcher photo remained unfinished…he intended it to have a gold background, with silver jeweled halos above each of the Beatle’s heads. Here are some more shots from that photo session. item 5 >>> Oh, What the Hell…But that butcher photo struck a chord with some in the art department at EMI records, and in June of 1966 it was used in an advertisement for the single “Paperback Writer”/”Rain” and on the cover of a music newspaper. The picture was only used for advertising…only in the UK…and it was not used for the picture sleeve the 45 came in. item 6 >>> Chopping Up the Beatles…Few of us back in the day were aware that until Sgt. Pepper, US and UK albums were completely different. Everyone knows it now, since the CD releases have followed the original British format, which was in fact how the Beatles recorded and planned them. (Altho in the US, a box set of CDs of the “American Albums” is available, it you must.) Here’s the tale of the tape: up until Sgt. Pepper, the Beatles released 7 LPs in England, and 8 singles that were not included on any album, as was the practice. That output resulted in 10 American albums on Capitol Records, plus the Hard Day’s Night soundtrack on United Arists. 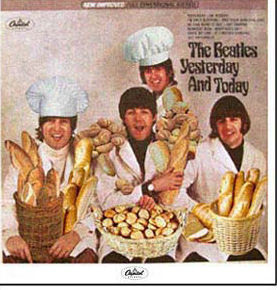 One of the worst examples of this slicing and dicing is Help!, the Beatles 5th British LP. In England, it consisted of 14 tracks…the 7 on side 1 were all from the movie…the 7 on side 2 were newly recorded songs. In America, the 7 movie tracks were included on the Help! soundtrack. Of the others, 3 went to Beatles VI, 2 were released as a 45: “Yesterday”/”Act Naturally,” and 2 went to the American version of Rubber Soul. 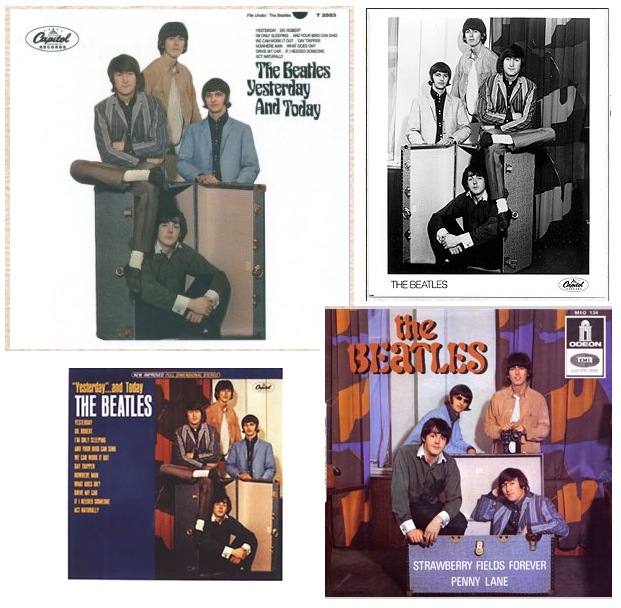 item 7 >>> Yesterday and Today…Rubber Soul had been released in time for Christmas, 1965. Revolver was planned for an August, 1966 release. Here in the States, Capital wanted an LP to release in June, and they started with the “Yesterday” 45, hence the title of the album. 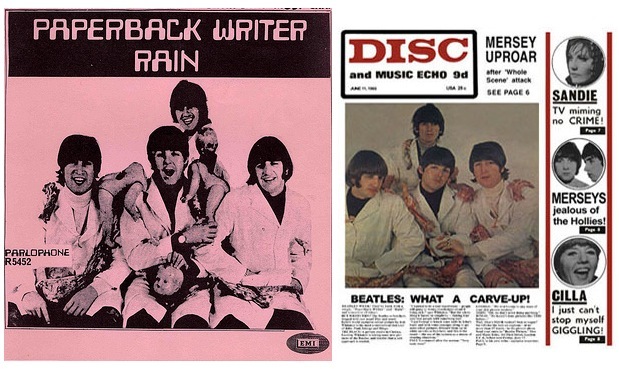 They added the “Daytripper”/”We Can Work it Out” 45 also from December 1965…4 tracks from the British version of Rubber Soul that had been left off the American version…and to fill out the album, 3 tracks from the upcoming Revolver were sent over from England. Now the Beatles at this point still recorded and mixed all their records in mono. They usually had virtually no interest or input in the stereo mixes. Thus, Capitol got the 3 Revolver songs in mono, and for their stereo LPs, doctored them up in “fake stereo,” their infamous Duophonic process, laden with compression and reverb. Yes, this was a rush job. True stereo versions of these 3 tracks would show up a little later, on the Capital Record Club pressings, and also on all tape formats. 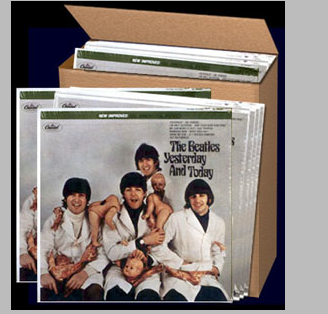 By the 1970s, newly pressed copies of Yesterday and Today also had these cuts in true stereo, which is why the original Duophonic versions are of special interest to Beatles collectors, and the record club albums highly sough after. And for the cover? item 8 >>> Here We Go…The Beatles generally had little to do with their American releases, altho they were aware of the differences and it irked them. It was apparently Paul who pushed for the used of the butcher photo. At the time he said it was “their protest against the war.” The notion that the cover was their comment on how Capitol “butchered” their albums is an urban legend…mentioned by Ringo long after the fact, but not substantiated by the other 3 Beatles. Thus, about 750,000 albums were prepared at Capitol’s 4 US pressing factories…mono versions outnumbering stereo 10 to 1…and sample copies were sent to record stores and radio stations. item 9 >>> Pass the Paste…And the reaction was overwhelmingly negative. 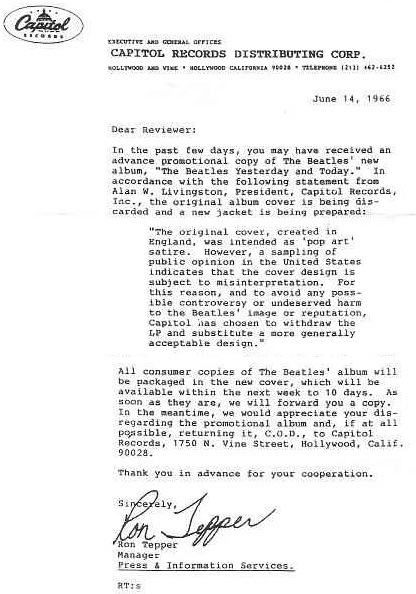 Capitol realized they’d blundered, and sent the letter shown above…note how they encouraged the return of the offending albums “C.O.D.” There is much debate among collectors on whether the Butcher Covers were ever actually available for sale in stores. The prevailing opinion is they were not, altho a few stores were apparently sent shipments, which were immediately returned…and of course a few of these could have “leaked” out, sold to customers or staff. 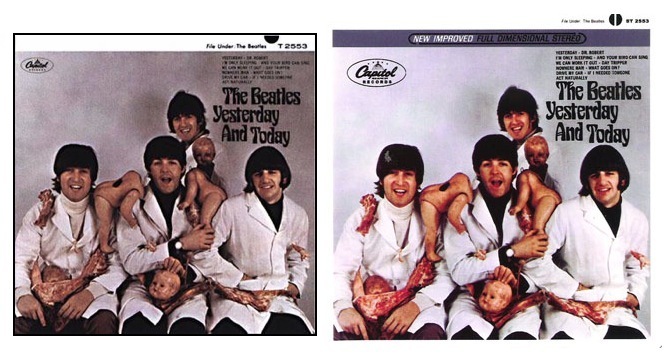 Initially, Capitol intended to destroy all the butcher covers, and this was done at one of their plants. But the decision was soon made to salvage the covers by pasting a new illustration over the old…what’s today called the “Trunk Cover,” a reversed version of another photo taken by Robert Whitaker. Also seen here in the bottom row is a rejected mock-up cover, along with a never used sleeve with another photo from the “trunk” photo session. This new cover was officially released on by 15th birthday, June 20, 1966. The album went to #1 a month later. item 10 >>> …and TODAY…Butcher Covers are collected in 3 “states.” State 1 is the original cover as it was originally intended to be marketed. These are extremely rare, and in pristine condition can sell for as much as $30,000. The ultimate State 1’s are the Livingston albums. In 1966, Capitol president Alan Livingston took home a carton of Butcher covers, 4 stereos and 20 monos. In 1996 he gave them to his son Peter, and they were all eventually sold to dealers. State 2 are called Paste-Overs…the Butcher cover with the Trunk cover still intact. You might have one of these! Carefully examine the upper half of the open trunk. Ringo’s black turtleneck should show thru to some extent. If you see absolutely nothing, you don’t have a State 2. State 3 refers to the infamous Peel-Jobs. When this was attempted in the 1960s, the results were generally not good, and the resulting Butcher Cover was typically torn and stained, altho even such poor examples can still fetch around $300. Thru the years, advanced techniques for peeling the trunk cover off have been developed, but there are always tell-tale smudges and scrapes. I actually saw a Peel-Job in pretty good shape back in college in the early 70s…I offered the guy $40, but it was no deal…altho he did give me heavily used copies of Traffic’s first 3 LPs for nothing, which I still have, so no hard feelings. And course, everyone can have the photo…it’s on the inside gatefold of the Beatles 1980 Rarities LP.